Do you need a golden wedding anniversary gift? Stuck for ideas? Read on and get some ideas that will help you commemorate fifty years of marriage in the right way. First of all we have to say congratulations for achieving fifty years of marriage. That congratulations goes out to the couple themselves as well as their closest friends and family who have offered support and love over the years. 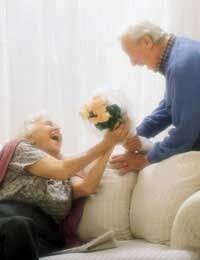 A golden wedding anniversary is cause of celebration and there are lots of gifts. Here is the lowdown on what you can do to mark the special day. If there were ever an excuse for a party, this would be it! A golden wedding anniversary deserves a golden party! If you are the couple then get planning. Invite your closest family and friends to join in the celebrations. This is an ideal way to commemorate your marriage. If you are one of the close friends and family, take action. Surprise the couple with a party and let it be your gift to them. Think about the type of celebration they would like – low key or elaborate – and start organising. Get contributions from other family members and friends. Invite anyone you think the couple considers close friends and that may mean relatives who live overseas so plan quite far in advance. There is a lot to think about – where to hold it, whether you need a caterer, what kind of entertainment you think you may have and what decorations you need. Keep all these details a secret from the couple. A surprise party will be a wonderful treat for them and they will be truly touched at the effort that the people surrounding them have made on their behalf. Golden wedding anniversaries equal gold! That might be an expensive gift idea but one that is very fitting for fifty years of marriage. His and hers gold watches, necklaces and commemorative rings are fantastic ideas that appropriately mark the day.You don’t have to stretch the budget to the max. You can buy a golden item and still keep your bank balance in reasonable condition. Golden-rimmed champagne glasses, gold picture frames, and golden ornaments, like a mantelpiece clock are all fitting for the occasion and special enough for a wedding anniversary like this. Sometimes gifts like a gold watch or a gold clock aren’t quite right. It might be that the other party just wouldn’t appreciate the gesture or that they already have such items in their own collection and the last thing they need is a new addition. In some cases the simple gifts are the most powerful ones. Don’t be afraid of resisting the grand and, perhaps empty, gifts and instead, giving something a little more personal. A hand written poem, summarising the way you feel about the marriage, is a simple gift but one that will no doubt surprise and overwhelm the receiver with love and thanks. Other ideas that are economical but rich in thought and impact? If you are a confident painter, put together a hand-painted portrait. If your skills are photographic, in the run up to the day get snapping and put together some flattering shots. On the day itself present an album stuffed with shots and memories. A golden wedding anniversary is to be celebrated. Make no mistake about it this is the time to blow the budget and mark the occasion. Remember though that this is your time so celebrate in the manner that you want. If you want to keep it low key, do so. Just make sure you enjoy the day as much as possible.